Gita Bhoomi Kurukshetra invites you to witness the spectacle of Cultural and Spiritual events where people come from all parts of the world. ** Daily one quiz question will be asked with 4 options. ** Daily one winner will be selected randomly from all participants having correct answer. ** Daily winner will be announced after 24hrs and result will available on website. ** Only daily participants of quiz will qualify as finalists. ** 3 mega prizes will given from finalist/daily participants after end of quiz through random process of selection. ** Final decision of approval or rejection of the quiz/participants will be of KDB. ** The Prize Amount/Term & Conditions/Event Date Time may change during/after the Event. 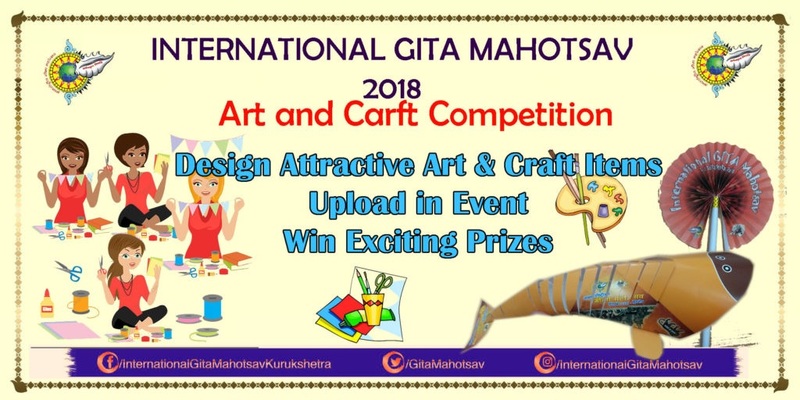 ** Invitation Card should be themed on and for International Gita Mahotsav 2018. ** The Participant have to upload the design in the Discussion wall of the Event. ** The Design will be approved by the Admin and can be liked by others. ** The participant will get maximum likes will be considered as winner. ** The likes will be counted only on the Event Discussion Page. ** Final decision of approval or rejection of the design/participants will be of KDB. ** Rangoli Design should be of International Gita Jayanti Logo. ** The Participant have to upload the fancy dress image in the Discussion wall of the Event. ** Fancy dress will be approved by the Admin and can be liked by others. ** Final decision of approval or rejection of fancy dress/participants will be of KDB. The Participant have to upload the pencil sketch in the Discussion wall of the Event. ** The pencil sketch will be approved by the Admin and can be liked by others. ** Final decision of approval or rejection of the pencil sketch/participants will be of KDB. ** Participant can participates for all three character/category but will be awarded for any one character/category. ** There is no age limit for participation. ** The Participant have to upload the Art & Craft images in the Discussion wall of the Event. ** The Art & Craft will be approved by the Admin and can be liked by others. ** Final decision of approval or rejection of the Art & Craft/participants will be of KDB.